Title: ORNEMENT DE L'ESPRIT ET DE LA MEMOIRE ou Choix d'Anecdotes, des traits intéressans, et de Narrations Historiques. Description: Paris, Saintin, Libraire 1820 Copperplates (20 finely engraved illustrations on ten plates). . 32mo speckled tan calf gilt (front cover re-attached, gilt flaking) 411pp. Nice prize inscription on front endpaper dated 17 Dec 1823 to Mademoiselle Beale from her French teacher at Pensionat de Mlles Rogers & Barker in Ashford. 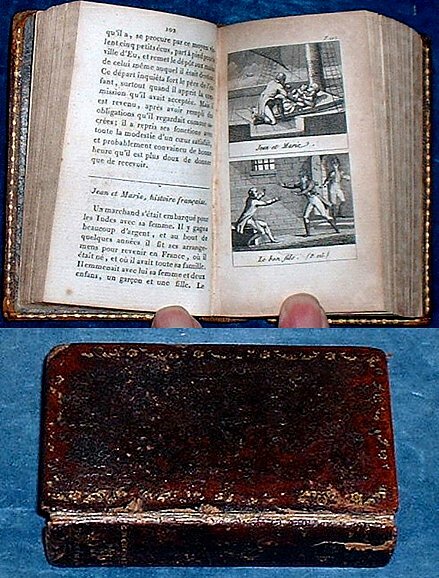 *Near miniature with lovely detailed engravings.